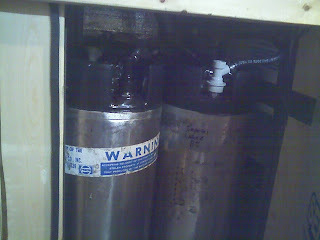 Last week the brown mini fridge that cooled my kegerator finally died. This little warrior went through many years of college and then to my cold plate cooler, and finally was the engine to my kegerator. Now it's gone. God's speed little Buddy. On to the future. My father had a mini fridge that he was willing to donate to the cause, so I decided to give this design another shot. 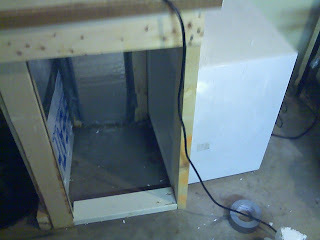 After reading a few kegerator ideas on Adam's blog, I saw this idea where the fridge has the door removed and a fan inside it to circulate the air. After some measurements and a little planning, I decided this was the way to go moving forward. 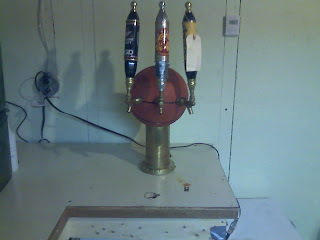 In the process of taking apart the kegerator, I was able to explore some of the issues that I had had with it, like the fact that it only fit 2 kegs and the tap I hod could work 3 beers. In making room on the sidewall for the new dorm fridge, I was able to make some adjustments to make space for the 3rd keg. Now three kegs fit into the kegerator. After a lot of time sealing and taping, I have the kegerator down to a steady 47f. I am not sure if the fridge is running constantly, but when I was testing it, it got down to 39f and was kicking on and off so I feel pretty good about the potential for this one. 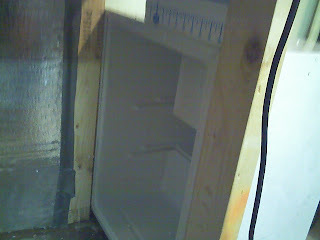 Finally, because I did not have to mount the fridge on the top of the box, I was able to move the tap back and utilize one of the holes that the fridge used before. This will allow me to have a bar runner on there so that I'm not dripping into a bucket. I know what you're thinking, I decided to avoid the drip tray and go for the bar runner because of the price difference, I am getting a bar runner for $6 with shipping, a drip tray that is big enough for 3 taps is over $50. Plus standing beer stinks no matter what's holding it. IMHO anyway. 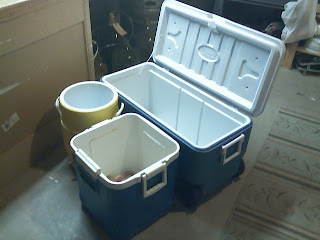 In other news, as I've been mentioning on Twitter, our 100qt cooler came in and it was WELL worth the $38 (with shipping) I paid. These things go for over $100 and this one was listed as "used", but it looks pretty new to me. The size difference is pretty staggering - Look at the other two mash tuns I was using next to it. Been a while since we heard from you. I have been doing a bit of work on my keg fridge too. I put up a blog about it. Check us out. Keep brewin' and blogin'! Nice MGD tap handle there! yea, don't get too attached to those hosses, there are 5 of them total! Seriously though, the plan has been to paint up the handles in SU colors so that I have a little 'Cuse basketball haven, we'll see if that ever comes to fruition. Yea that would be the easy way to go, but I am never one to do the easy thing...Go 'Cuse - Next year we'll make the tournament!